Haskell is a high level language. A really high level language. We can spend our days programming entirely in abstractions, in monoids, functors and hylomorphisms, far removed from any particular hardware model of computation. The language specification goes to great lengths to avoid prescribing any particular evaluation model. These layers of abstraction let us treat Haskell as a notation for computation itself, letting the programmer concentrate on the essence of their problem without getting bogged down in low level implementation decisions. We get to program in pure thought. However, this is a book about real world programming, and in the real world, code runs on stock hardware with limited resources. Our programs will have time and space requirements that we may need to enforce. As such, we need a good knowledge of how our program data is represented, the precise consequences of using lazy or strict evaluation strategies, and techniques for analyzing and controlling space and time behavior. In this chapter we'll look at typical space and time problems a Haskell programmer might encounter, and how to methodically analyse, understand and address them. To do this we'll use investigate a range of techniques: time and space profiling, runtime statistics, and reasoning about strict and lazy evaluation. We'll also look at the impact of compiler optimizations on performance, and the use of advanced optimization techniques that become feasible in a purely functional language. 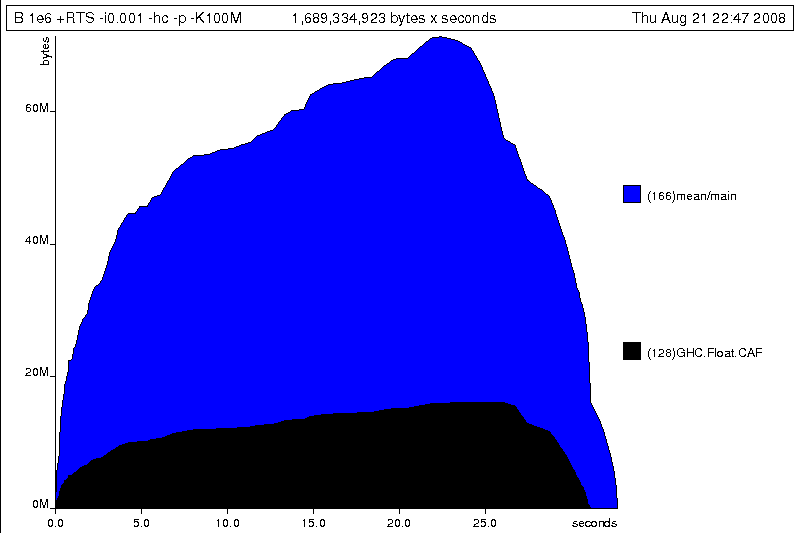 So let's begin with a challenge: squashing unexpected memory usage in some inoccuous looking code. Let's consider the following list manipulating program, which naively computes the mean of some large list of values. While only a program fragment (and we'll stress that the particular algorithm we're implementing is irrelevant here), it is representative of real code we might find in any Haskell program: typically concise list manipulation code, and heavy use of standard library functions. It also illustrates several common performance trouble spots that can catch out the unwary. It worked well for small numbers, but the program really started to struggle with input size of ten million. From this alone we know something's not quite right, but it's unclear what resources are being used. Let's investigate. To get access to that kind of information, GHC lets us pass flags directly to the Haskell runtime, using the special +RTS and -RTS flags to delimit arguments reserved for the runtime system. The application itself won't see those flags, as they're immediately consumed by the Haskell runtime system. So let's run the program with statistic reporting enabled, via +RTS -sstderr, yielding this result. When using -sstderr, our program's performance numbers are printed to the standard error stream, giving us a lot of information about what our program was doing. In particular, it tells us how much time was spent in garbage collection, and what the maximum live memory usage was. It turns out that to compute the mean of a list of 10 million elements our program used a maximum of 742 megabytes on the heap, and spent 96.9% of its time doing garbage collection! In total, only 3.1% of the program's running time was spent doing productive work. So why is our program behaving so badly, and what can we do to improve it? After all, Haskell is a lazy language: shouldn't it be able to process the list in constant space? 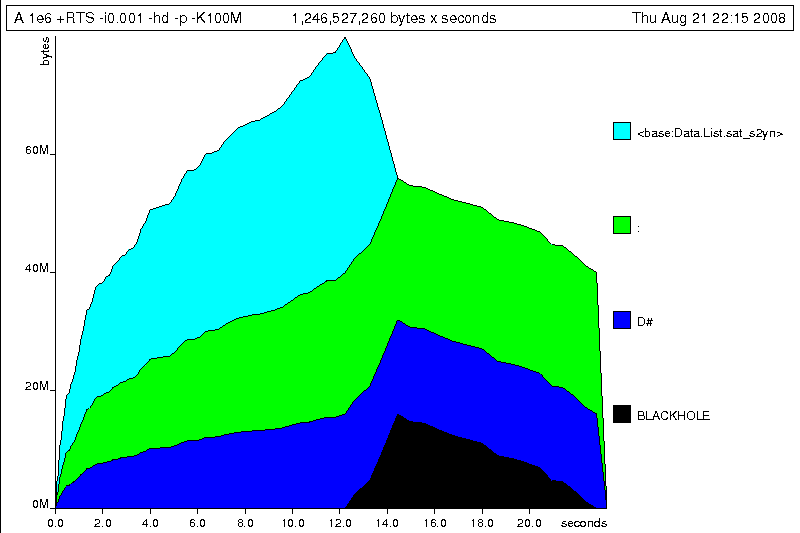 GHC, thankfully, comes with several tools to analyze a program's time and space usage. In particular, we can compile a program with profiling enabled, which, when run, yields useful information about what resources each function was using. Profiling proceeds in three steps: compiling the program for profiling; running it with particular profiling modes enabled; and inspecting the resulting statistics. Alternatively, we can have the compiler insert the cost centres on all top level functions for us by compiling with the -auto-all flag. Manual cost centres are a useful addition to automated cost centre profiling, as once a hot spot has been identified, we can precisely pin down the expensive sub-expressions of a function. One complication to be aware of: in a lazy, pure language like Haskell, values with no arguments need only be computed once (for example, the large list in our example program), and the result shared for later uses. Such values are not really part of the call graph of a program, as they're not evaluated on each call, but we would of course still like to know how expensive their one-off cost of evaluation was. To get accurate numbers for these values, known as "constant applicative forms", or CAFs, we use the -caf-all flag. This gives us a view into the program's runtime behavior. We can see the program's name and the flags we ran it with. The "total time" is time actually spent executing code from the runtime system's point of view, and the total allocation is the number of bytes allocated during the entire program run (not the maximum live memory, which was around 700MB). The second section of the profiling report is the proportion of time and space each function was responsible for. The third section is the cost centre report, structured as a call graph (for example, we can see that mean was called from main. The "individual" and "inherited" columns give us the resources a cost centre was responsible for on its own, and what it and its children were responsible for. Additionally, we see the one-off costs of evaluating constants (such as the floating point values in the large list, and the list itself) assigned to top level CAFs. What conclusions can we draw from this information? We can see that the majority of time is spent in two CAFs, one related to computing the sum, and another for floating point numbers. These alone account for nearly all allocations that occurred during the program run. Combined with our earlier observation about garbage collector stress, it begins to look like the list node allocations, containing floating point values, are causing a problem. For simple performance hot spot identification, particularly in large programs where we might have little idea where time is being spent, the initial time profile can highlight a particular problematic module and top level function, which is often enough to reveal the trouble spot. Once we've narrowed down the code to a problematic section, such as our example here, we can use more sophisticated profiling tools to extract more information. Beyond basic time and allocation statistics, GHC is able to generate graphs of memory usage of the heap, over the program's lifetime. This is perfect for revealing "space leaks", where memory is retained unnecessarily, leading to the kind of heavy garbage collector activity we see in our example. Constructing a heap profile follows the same steps as constructing a normal time profile, namely, compile with -prof -auto-all -caf-all, but when we execute the program, we'll ask the runtime system to gather more detailed heap use statistics. We can break down the heap use information in several ways: via cost-centre, via module, by constructor, by data type, each with its own insights. 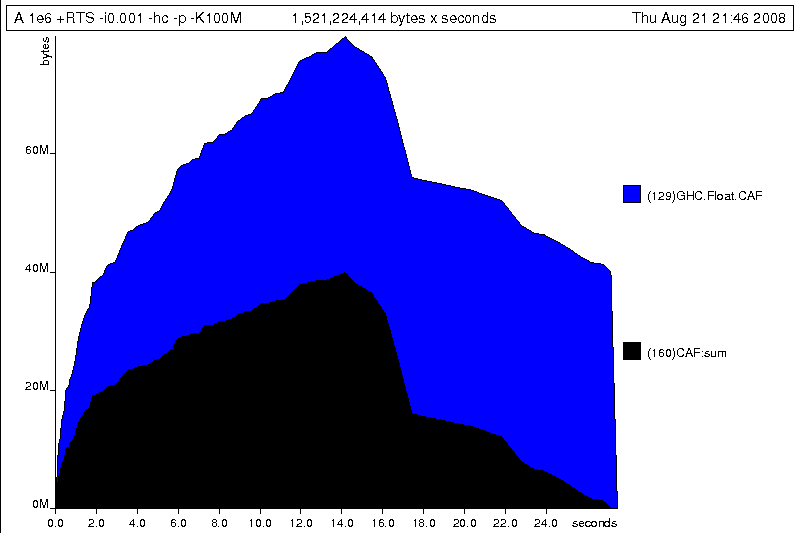 Heap profiling A.hs logs to a file A.hp, with raw data which is in turn processed by the tool hp2ps, which generates a PostScript-based, graphical visualization of the heap over time. At first we sum our list, which triggers the allocation of list nodes, but we're unable to release the list nodes once we're done, as the entire list is still needed by length. As soon as sum is done though, and length starts consuming the list, the garbage collector can chase it along, deallocating the list nodes, until we're done. These two phases of evaluation give two strikingly different phases of allocation and deallocation, and point at exactly what we need to do: traverse the list only once, summing and averaging it as we go. Now, instead of taking the sum of the list, and retaining the list until we can take its length, we left-fold over the list, accumulating the intermediate sum and length values in a pair (and we must left-fold, since a right-fold would take us to the end of the list and work backwards, which is exactly what we're trying to avoid). The question is: why are we building up more and more allocated state, when all we are doing is folding over the list? This, it turns out, is a classic space leak due to excessive laziness. The problem is that our left-fold, foldl, is too lazy. What we want is a tail recursive loop, which can be implemented effectively as a goto, with no state left on the stack. In this case though, rather than fully reducing the tuple state at each step, a long chain of thunks is being created, that only towards the end of the program is evaluated. At no point do we demand reduction of the loop state, so the compiler is unable to infer any strictness, and must reduce the value purely lazily. This loop uses `seq` to reduce the accumulated state at each step, but only to the outermost constructor on the loop state. That is, seq reduces an expression to "weak head normal form". Evaluation stops on the loop state once the first constructor is reached. In this case, the outermost constructor is the tuple wrapper, (,), which isn't deep enough. The problem is still the unevaluated numeric state inside the tuple. Unlike our first version, this program is 97.4% efficient, spending only 2.6% of its time doing garbage collection, and it runs in a constant 1 megabyte of space. It illustrates a nice balance between mixed strict and lazy evaluation, with the large list unfolded lazily, while we walk over it, strictly. The result is a program that runs in constant space, and does so quickly. We change the implementation of foldl' to reduce the state to normal form, using the rnf strategy. This also raises an issue we avoided earlier: the type inferred for the loop accumulator state. Previously, we relied on type defaulting to infer a numeric, integral type for the length of the list in the accumulator, but switching to rnf introduces the NFData class constraint, and we can no longer rely on defaulting to set the length type. In large projects, when we are investigating memory allocation hot spots, bang patterns are the cheapest way to speculatively modify the strictness properties of some code, as they're syntactically less invasive than other methods. This implementation again has the same efficient, constant space behavior. 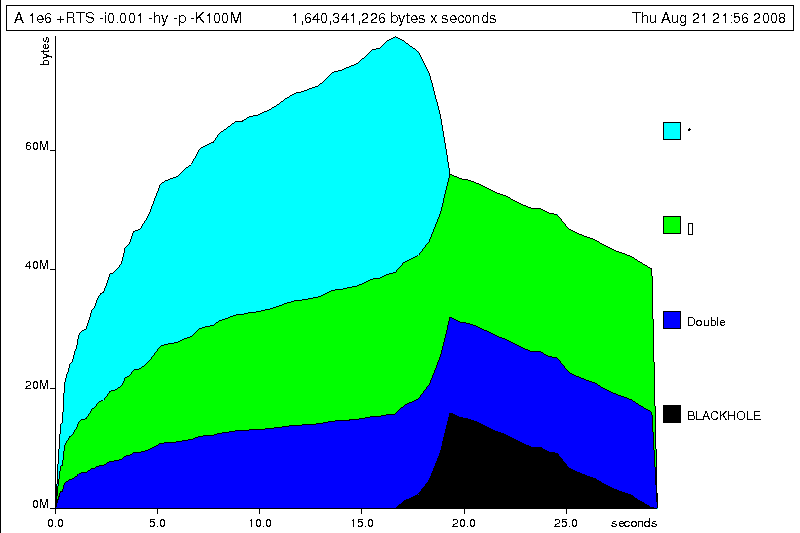 At this point, to squeeze the last drops of performance out of this code, though, we have to dive a bit deeper. Besides looking at runtime profiling data, one sure way of determining exactly what your program is doing is to look at the final program source after the compiler is done optimizing it, particularly in the case of Haskell compilers, which can perform very aggressive transformations on the code. GHC uses what is humorously referred to as "a simple functional language", known as Core, as the compiler intermediate representation. It is essentially a subset of Haskell, augmented with unboxed data types (raw machine types, directly corresponding to primitive data types in languages like C), suitable for code generation. GHC optimizes Haskell by transformation, repeatedly rewriting the source into more and more efficient forms. The Core representation is the final functional version of your program, before translation to low level imperative code. In other words, Core has the final say, and if all-out performance is your goal, it is worth understanding. This is the final version of our foldl', and tells us a lot about the next steps for optimization. The fold itself has been entirely inlined, yielding an explicit recursive loop over the list. The loop state, our strict pair, has disappeared entirely, and the function now takes its length and sum accumulators as direct arguments along with the list. The sum of the list elements is represented with an unboxed Double# value, a raw machine double kept in a floating point register. This is ideal, as there will be no memory traffic involved keeping the sum on the heap. However, the length of the list, since we gave no explicit type annotation, has been inferred to be a heap-allocated Integer, with requires a non-primitive plusInteger to perform addition. If it is algorithmically sound to use a Int instead, we can replace Integer with it, via a type annotation, and GHC will then be able to use a raw machine Int# for the length. We can hope for an improvement in time and space by ensuring both loop components are unboxed, and kept in registers. The base case of the loop, its end, yields an unboxed pair (a pair allocated only in registers), storing the final length of the list, and the accumulated sum. Notice that the return type is a heap-allocated Double value, indicated by the D# constructor, which lifts a raw double value onto the heap. Again this has implications for performance, as GHC will need to check that there is sufficient heap space available before it can allocate and return from the loop. We can avoid this final heap check by having GHC return an unboxed Double# value, which can be achieved by using a custom pair type in the loop. In addition, GHC provides an optimiztion that unboxes the strict fields of a data type, ensuring the fields of the new pair type will be stored in registers. This optimization is turned on with -funbox-strict-fields. While our original program, when operating on a list of 10 million elements, took more than a minute to run, and allocated more than 700 megabytes of memory, the final version, using a simple higher order fold, and a strict data type, runs in around half a second, and allocates a total of 1 megabyte. Quite an improvement! These simple strategies are enough to identify and squash untoward memory use issues, and when used wisely, can avoid them occurring in the first place. The final bottleneck in our program is the lazy list itself. While we can avoid allocating it all at once, there is still memory traffic each time around the loop, as we demand the next cons cell in the list, allocate it to the heap, operate on it, and continue. The list type is also polymorphic, so the elements of the list will be represented as heap allocated Double values. What we'd like to do is eliminate the list entirely, keeping just the next element we need in a register. Perhaps surprisingly, GHC is able to transform the list program into a listless version, using an optimization known as deforestation, which refers to a general class of optimizations that involve eliminating intermediate data structures. Due to the absence of side effects, a Haskell compiler can be extremely aggressive when rearranging code, reordering and transforming wholesale at times. The specific deforestation optimization we will use here is stream fusion. This optimization transforms recursive list generation and transformation functions into non-recursive unfolds. When an unfold appears next to a fold, the structure between them is then eliminated entirely, yielding a single, tight loop, with no heap allocation. The optimization isn't enabled by default, and it can radically change the complexity of a piece of code, but is enabled by a number of data structure libraries, which provide "rewrite rules", custom optimizations the compiler applies to functions the library exports. Given that our Core is now optimal, the only step left to take this program further is to look directly at the assembly. Of course, there are only small gains left to make at this point. To view the generated assembly, we can use a tool like ghc-core, or generate assembly to standard output with the -ddump-asm flag to GHC. We have few levers available to adjust the generated assembly, but we may choose between the C and native code backends to GHC, and, if we choose the C backend, which optimization flags to pass to GCC. Particularly with floating point code, it is sometimes useful to compile via C, and enable specific high performance C compiler optimizations. We've effectively massaged the program through multiple source-level optimizations, all the way to the final assembly. There's nowhere else to go from here. Optimising code to this level is very rarely necessary, of course, and typically only makes sense when writing low level libraries, or optimizing particularly important code, where all algorithm choices have already been determined. For day-to-day code, choosing better algorithms is always a more effective strategy, but it's useful to know we can optimize down to the metal if necessary. In this chapter we've looked at a suite of tools and techniques you can use to track down and identify problematic areas of your code, along with a variety of conventions that can go a long way towards keeping your code lean and efficient. The goal is really to program in such a way that you have good knowledge of what your code is doing, at all levels from source, through the compiler, to the metal, and be able to focus in on particular levels when requirements demand. By sticking to simple rules, choosing the right data structures, and avoiding the traps of the unwary, it is perfectly possible to reliably achieve high performance from your Haskell code, while being able to develop at a very high level. The result is a sweet balance of productivity and ruthless efficiency.